Maureen Anders of Anders Ruff here to rock out this One Direction Movie Viewing Party that we recently styled for Sony Pictures. 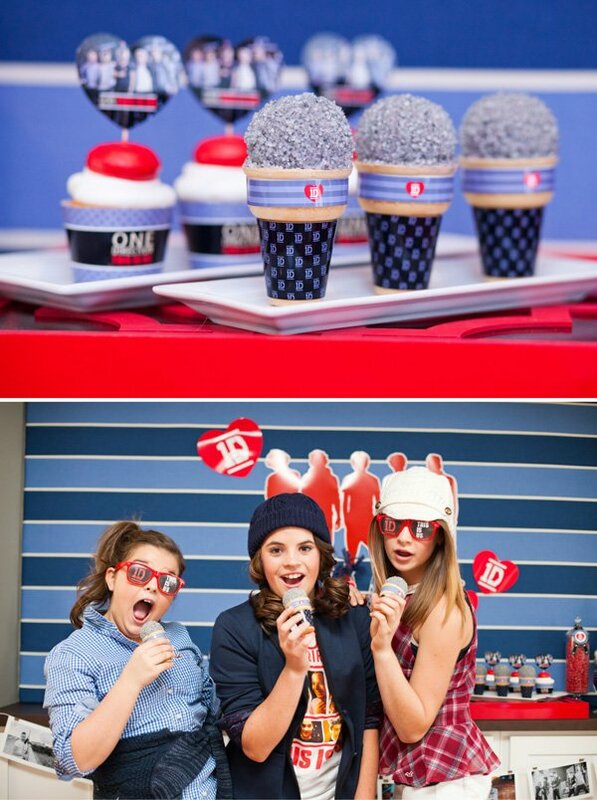 Teen and tween 1D fans went “crazy, crazy, crazy” over the karaoke activity, photo wall, themed dessert table and of course the movie watching snacks. 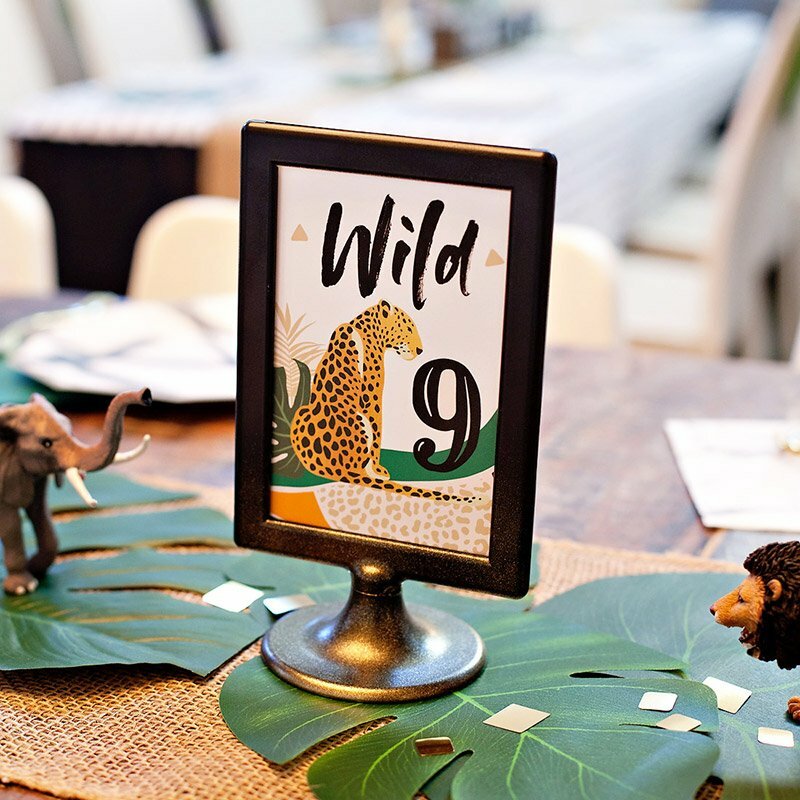 Check out all of the gorgeous photos (taken by Becca Bond Photography) and read on for more of our party styling tips, FREE printables and 1D Movie Viewing Party ideas! 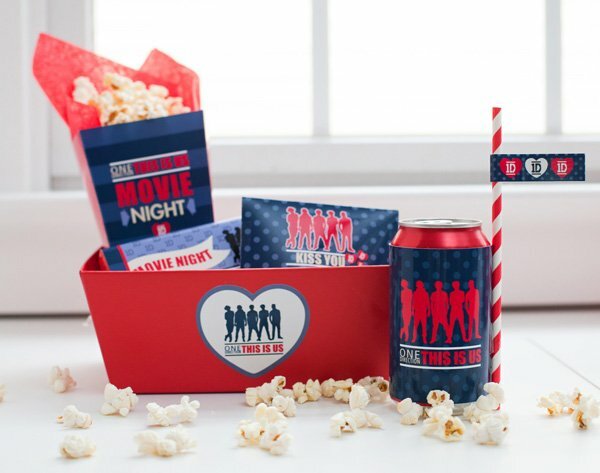 Individual movie viewing snack boxes with printable popcorn box, candy wrappers, gum wrappers and more! 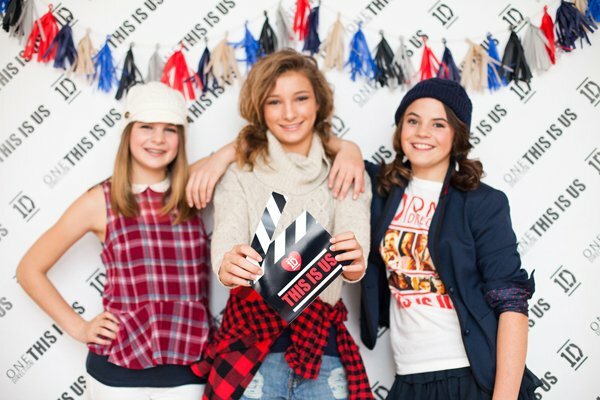 Adria and I are so excited to share that we recently partnered with Sony Pictures Home Entertainment to create, design and style a One Direction: This is Us Movie Viewing Party complete with free printable invitations, printable backdrops for a photo booth and party decor! 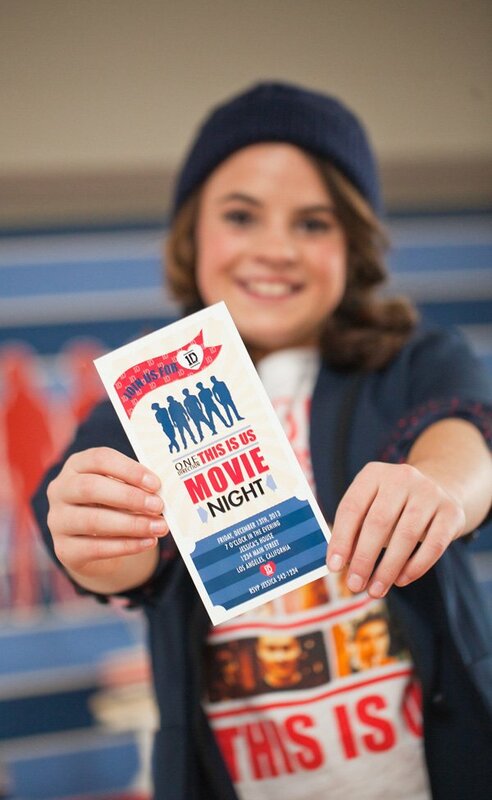 All of the FREE “1D: This is Us” Viewing Party Printables can be downloaded from the links at the bottom of this post! Invite your friends over for a One Direction Viewing Party with our Free Printable Invitation, which is editable so you can add your own party details at the bottom! The debut of “1D: This is Us” on Blu-ray™ Combo Pack with UltraViolet™ was December 17th from Sony Pictures Home Entertainment (SPHE). Buy the movie here! 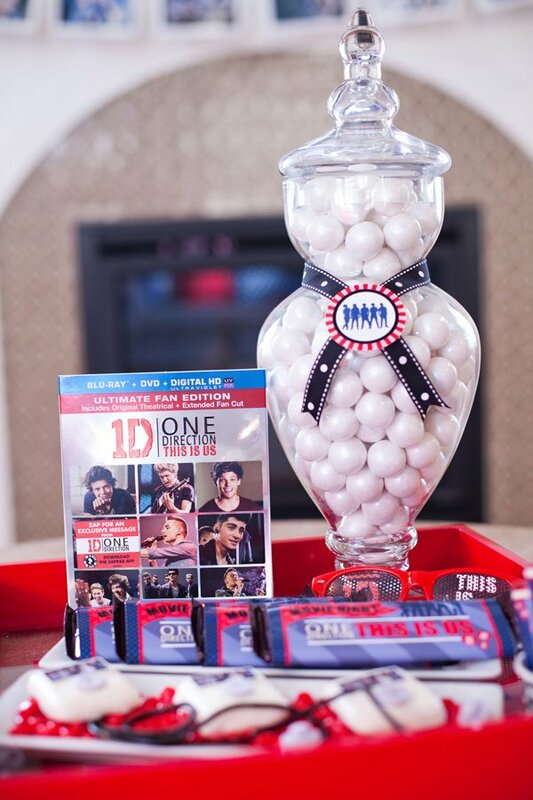 To host your own viewing party, you can create a 1D themed Dessert bar with easy and yummy desserts and candies! You can print the background silhouette and 1D Heart graphics from the printable collection. The banner is also available as a free printable with photos of the guys. 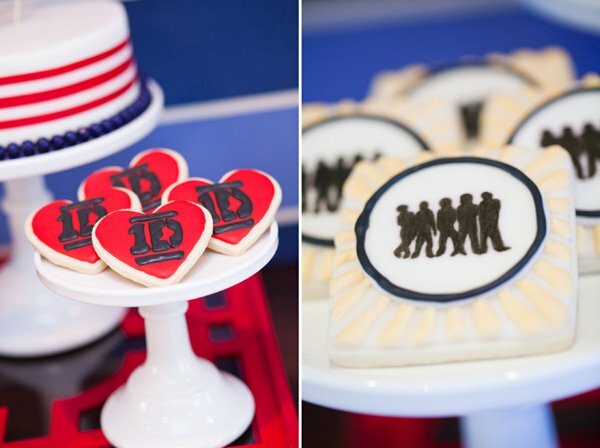 The amazing Lisa of Nicole Lee Confections made these amazing 1D Sugar Cookies for our celebration. You can download the printable cake toppers to create a 1D themed Cake using any inexpensive white store bought cake. We filled glass apothecary jars with red, white and dark blue candy from CandyGalaxy.com and added a printable 2″ party logo with ribbon around the neck of each jar. The girls were so excited to watch the “1D: This is Us” movie! 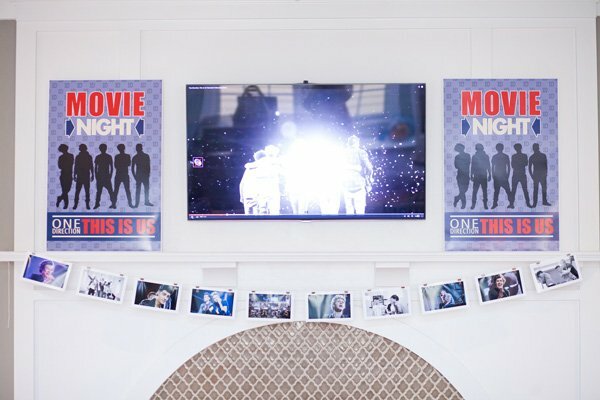 We created a movie viewing room with printable posters and decor for the 1D theme. We mixed in blues, red, black and cream as part of the decor. We decorated the mantle with printable 20×30 posters for the movie night! 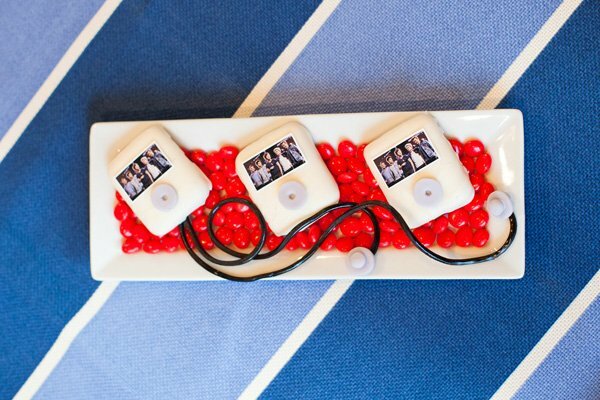 The strung photo banner of the guys from the dessert table was also repeated on the mantle. We used binder clips to attach the printable photos of the guys onto cotton twine on the mantle. 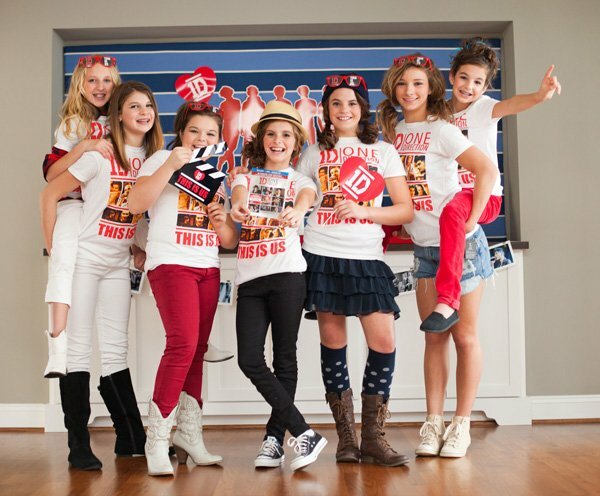 Each girl got a Movie Snack Tray that included 1D themed treats and snacks! In the family room, the centerpiece on the coffee table had fun 1D sunglasses as well as chocolate bars that were wrapped with printable chocolate bar wrappers, ipod Touch cookies (Recipe here! ), and packs of gum that were decorated with our printable gum wrapper. Nashville Wraps provided the red market trays that we filled with the snacks and soda. We wrapped soda cans with a printable pop can wrapper and added a paper straw (from Pleased as Punch) along with a printable party flag from the free printable collection. In each Movie Snack Tray, we included a cellophane bag (Nashville Wraps) filled with Hershey Kisses in red and silver. Of course we added our 3/4″ logo to the bottom of each kiss and topped the bags with the printable “Kiss You” Bag topper printable (all available to download and print for free)! We bought boxes of movie candy and wrapped them with the printable movie candy box wrapper. These were yummy red hots! 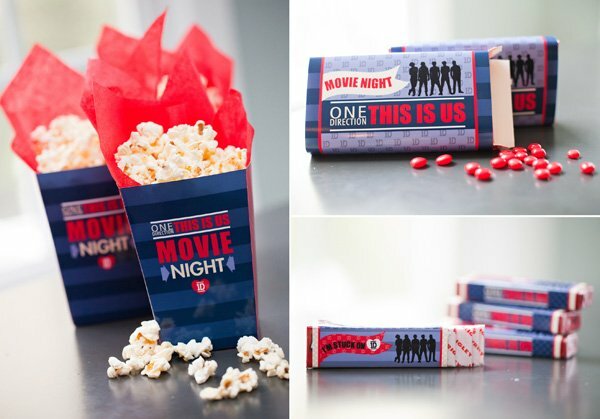 Download and print the 1D popcorn box template that we designed and fill with yummy buttered popcorn perfect for movie viewing. We lined each popcorn box with red tissue paper (from Nashville Wraps) for an extra pop of color! Packs of Big Red gum were purchased from the dollar store and wrapped with our printable gum wrapper! 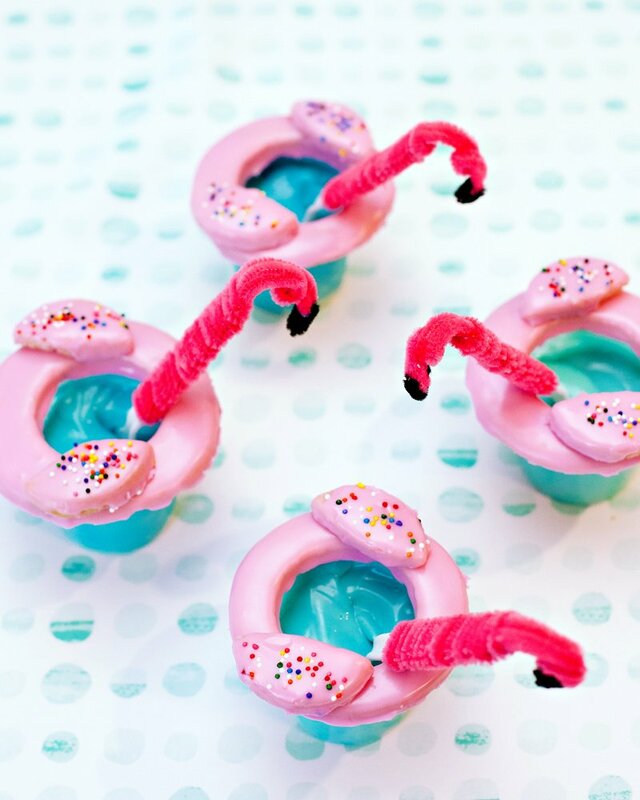 The girls loved these! Don’t forget to add the printable heart logo to the front of your Movie Snack Tray! 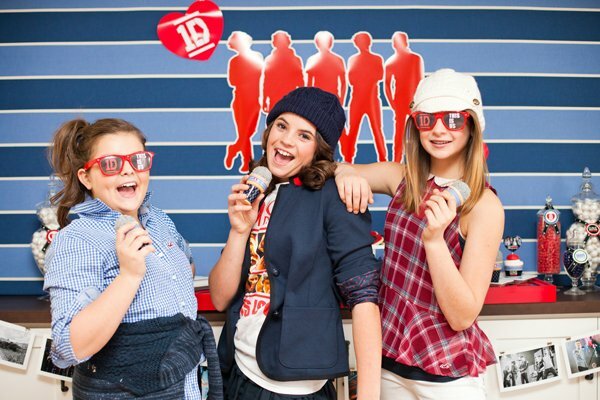 The girls all loved showing off their 1D fashion in front of the One Direction This is Us photo wall photo booth! We had the black and white backdrop hung on a big wall — we put two of the 36×72 posters together to create the larger backdrop. Tissue fringe garland was added to add a pop of color on the photo wall! Print off the photobooth props to use as part of the photo taking activity. 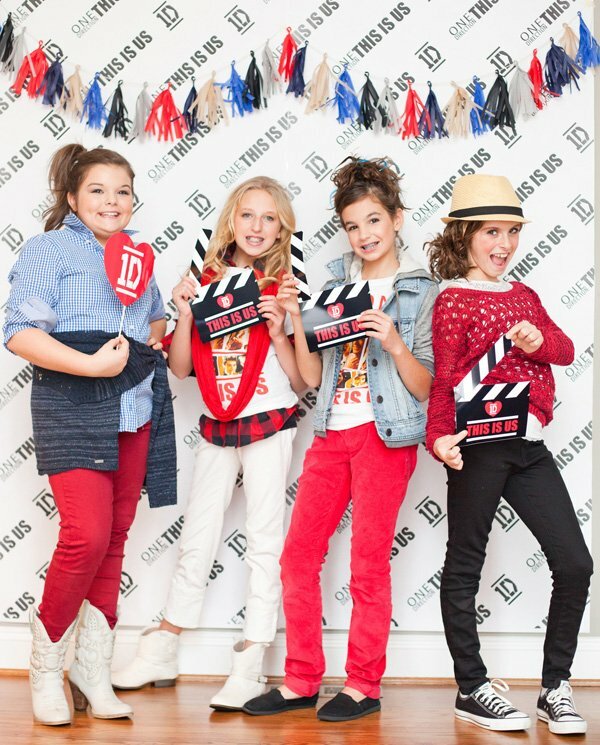 One Direction This is Us clapboards and 1D hearts were so much fun for the girls to show off! We printed off photos of the girls and let them take the photos home to remember the fun night! The girls went crazy over the 1D This is Us themed favor bags. 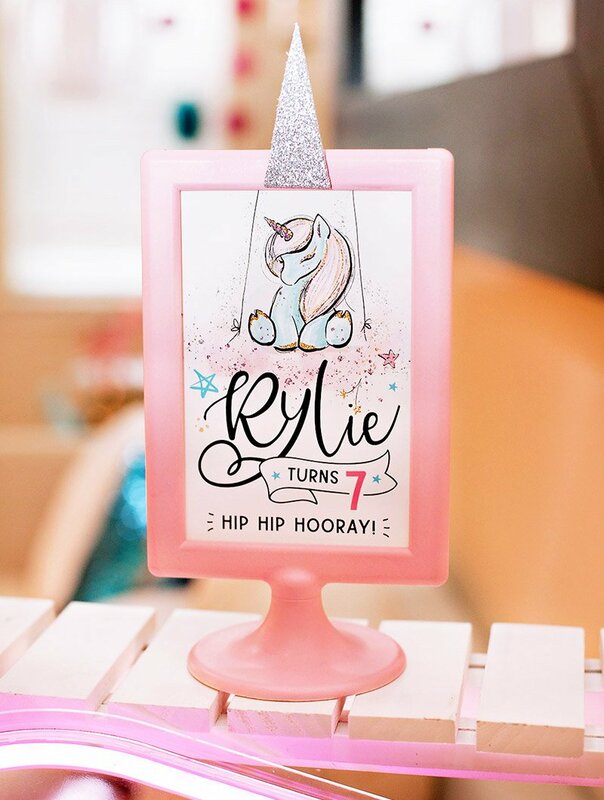 We printed the iron on design (free printable!) onto onlinelabels.com opaque transfer sheets. We then ironed them onto Nashville Wraps cotton drawstring bags. We printed off the favor hangtags from our free printable collection to tie onto the bags. We also included water bottles with the printable drink wrap, mini red hot boxes (CandyGalaxy.com) wrapped with our printable wrapper, and chap stick with our printable wrap. 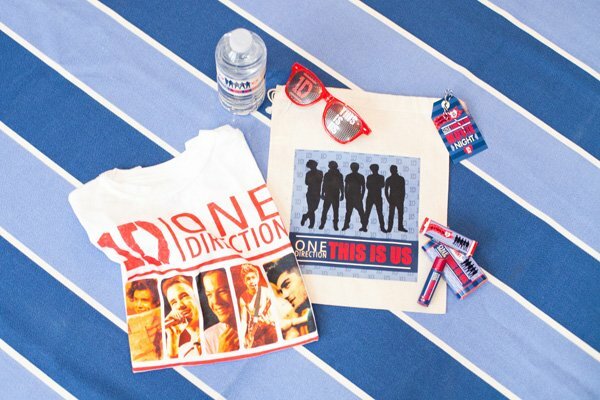 Packs of gum with our wrappers were also included as well as the 1D This is Us t-shirt and sunglasses. It all made the perfect take-home favor! 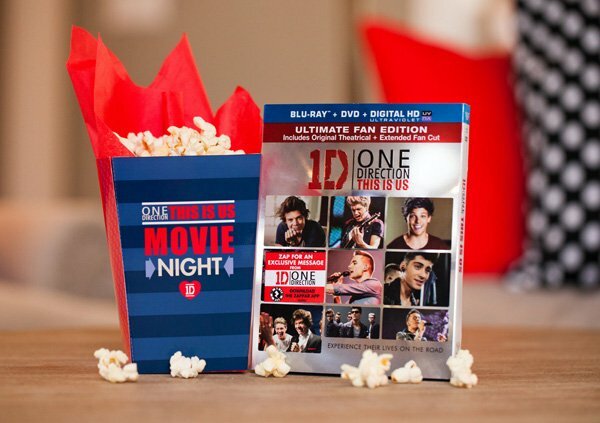 You can purchase the 1D: This is Us Movie here. 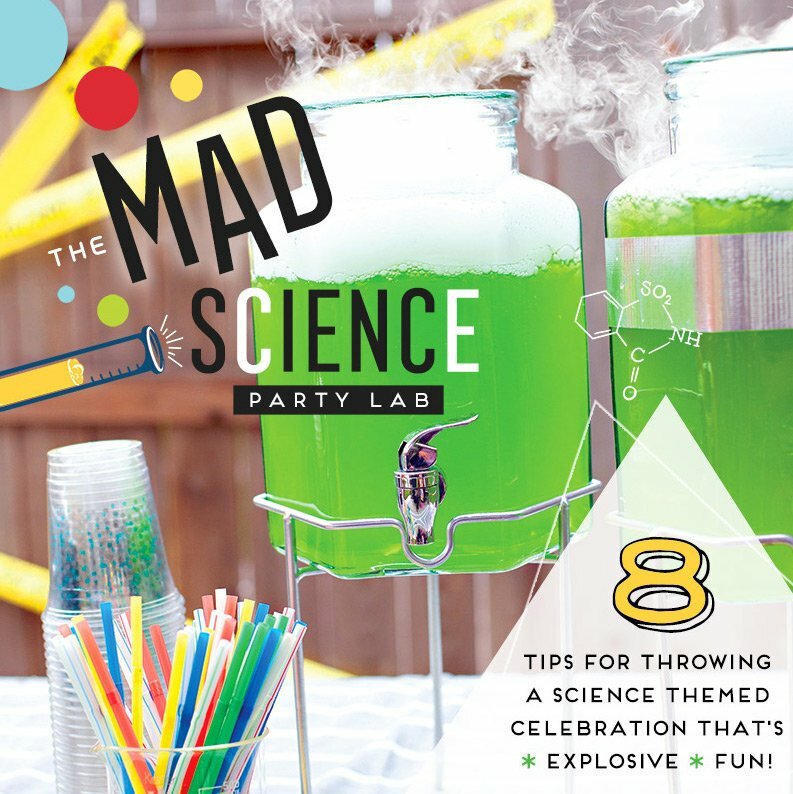 All of the printables shown in this party are available to download for free. Download the 4×8 Printable Editable Viewing Party Invitation here. 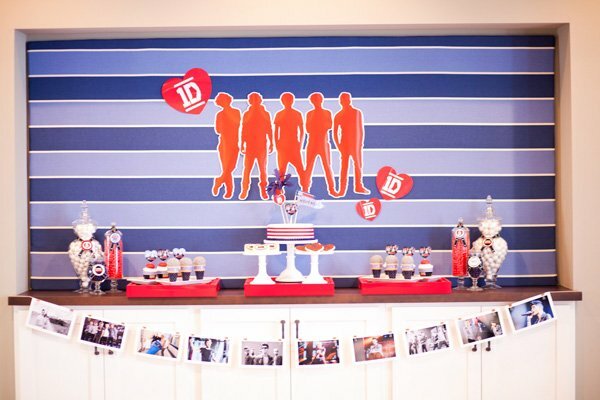 Download the Printable One Direction Viewing Party Printable Decor Collection here. Download the Printable One Direction Photo Banner here. 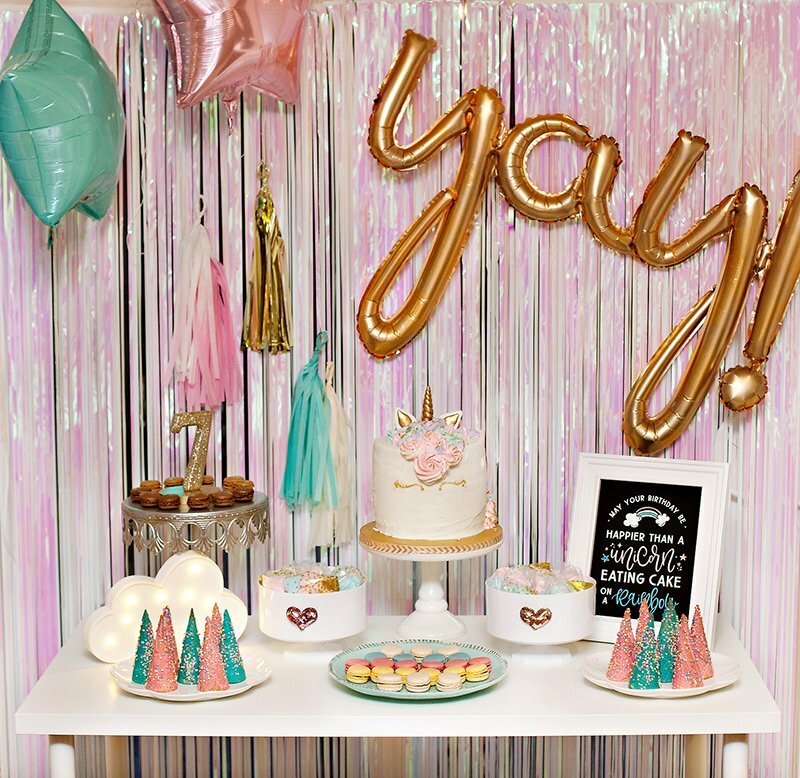 Download the 36″x72″ Printable Photo Wall Backdrop here. Download the Red Silhouette of the 1D Band from the backdrop here. 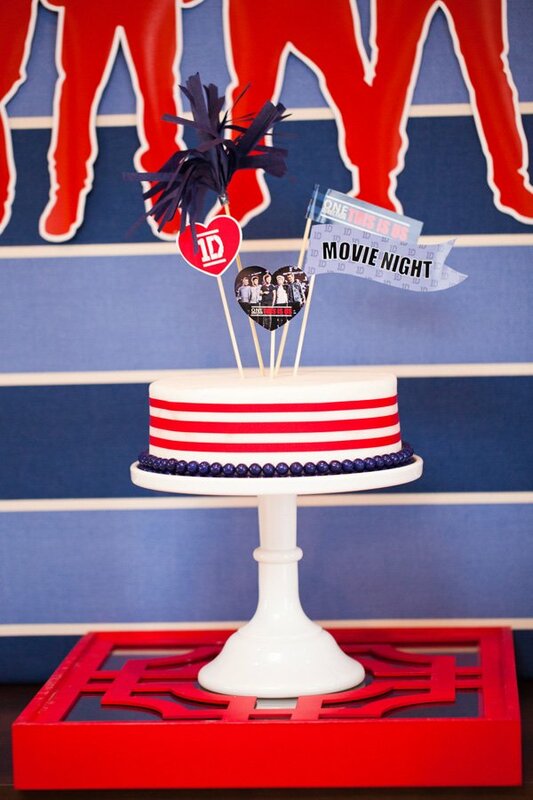 Be sure to Tweet, Vine and Instagram photos and videos of your 1D viewing parties using the tag #1DMovieParty. You can visit the 1D Official Website for more news on the “1D: This is Us” movie!